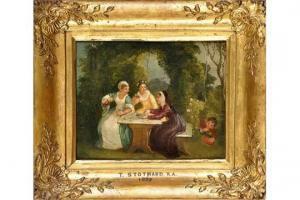 Find artworks, auction results, sale prices and pictures of Thomas Stothard at auctions worldwide. Thomas Stothard - "two Married Women And The Widow"
Thomas Stothard, R.A. (1755-1834) "TWO MARRIED WOMEN AND THE WIDOW" with inscription and sundry printed labels verso oil on panel 17.5 x 22cms; 7 x 8 3/4in. 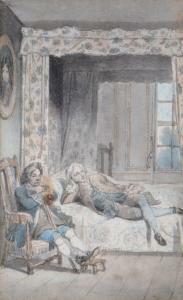 PROVENANCE David Laing; Charles Kirkpatrick Sharp - sold from his collection at Christie's 2nd June 1876, Catalogue No. 133. Sir William Stirling-Maxwell Bt. K.T., Pollock House, Glasgow; Mrs. Maxwell Macdonald; purchased at auction Morrison, McChlery & Co., Glasgow, October 1967, Catalogue No. 205. 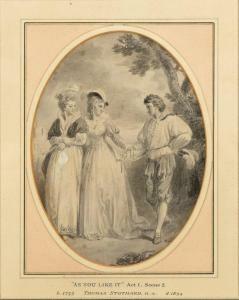 Unsigned, the artist identified on a plaque affixed to the frame of the latter. Oil on panel, 14 1/2 x 14 1/2 in. 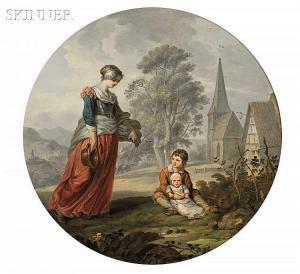 (36.8 x 36.8 cm), framed. with a restored break along the vertical axis, not painted under the liner. The split referenced previously is retouched. There are additional minor dots and dashes of (old) retouch. The works might benefit from cleaning.